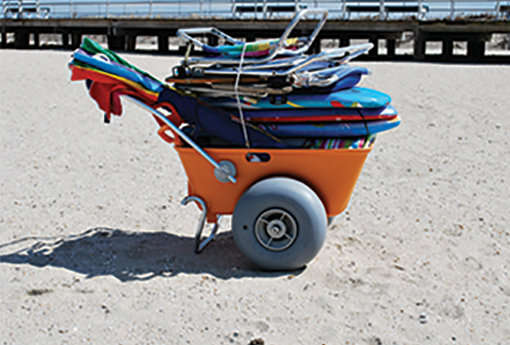 The Wheeleez® Beach Cart is the perfect beach cart when you have a lot to carry. You don’t need extra trips to get your cooler, beach chairs and umbrellas to the beach. Transporting all your gear at once over soft sand, pebbly beaches, or mud can be done in one trip. The Wheeleez® Beach Cart is easy to store because the handle bar and kickstand fold and the wheels and axles can be removed without tools. And it comes with bungee to secure items. Holds a family of 4s belongings all in one cart! $375+ tax. Rent them to your guests or offer them as a courtesy. Every beach house owner needs one!!! * Stock is limited. Now it possible for everyone to spend a wonderful day at the beach. 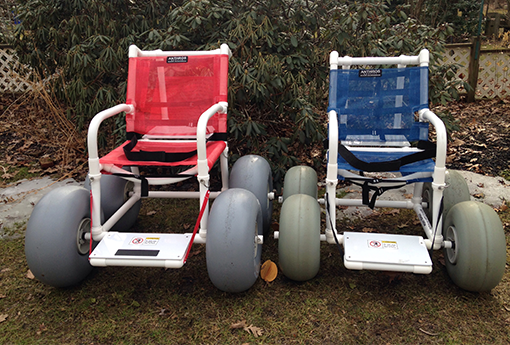 Wheeleez®, wheels that can traverse beach sand, back yards and rural terrain beach wheelchair makes it possible for anyone to get out on the sand. Imagine you own beach wheelchair! Use at your convenience, beach, hiking trails, backyard parties-anywhere, anytime! Comes apart in two pieces easily to fit in most vehicles!